There are few dwellings more IN right now than the treehouse. They’re whimsical, they’re adventurous —they’re basically just all-around awesome. 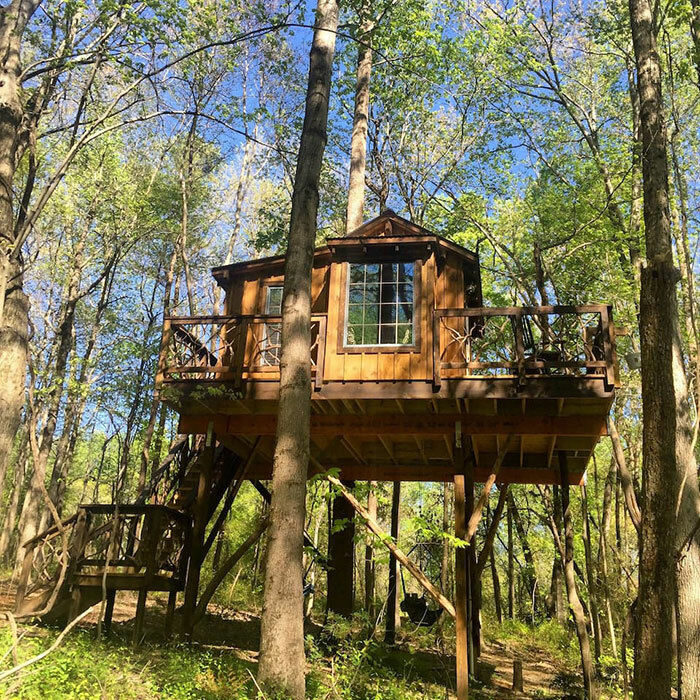 If you find yourself wanting to get your Swiss Family Robinson on, here are eight treehouses all within driving distance of Charlotte that you and your squad or significant other can reserve today. Just search on Airbnb and book. This rustic and romantic treehouse sits on a twenty-six acre farm and features a huge deck, full indoor bathroom, a fire pit, and a swing bed outside for your relaxation. It offers heat and AC, and the kitchenette provides a sink, mini fridge, and coffee maker. There are two sleeping lofts and the treehouses is fitted with beautiful wood details. Your treehouse adventure could be waiting for you right up the road. Dates available in December. Another treehouse found at the nearby Treesort, Big Nick consists of two separate rooms connected by a skywalk bridge. The cute country décor and the beautiful wood detailing makes for a charming treehouse visit. There is a full indoor bathroom, fire pit, and the kitchenette offers a minifridge, microwave, and Keurig. 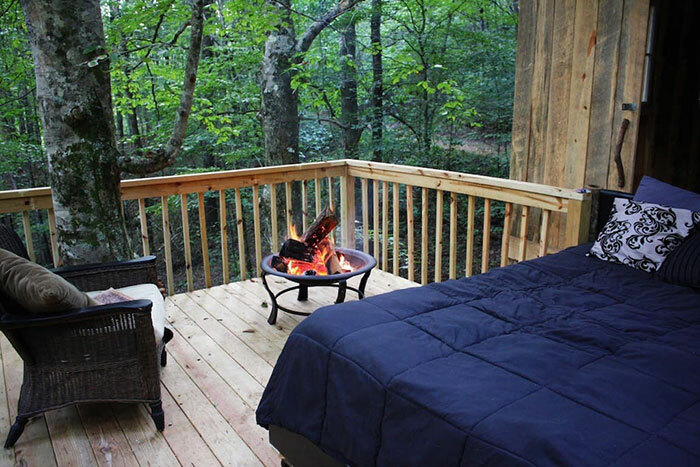 The treehouse has two beds and a futon, so make a couples weekend out of it! Dates available in December. 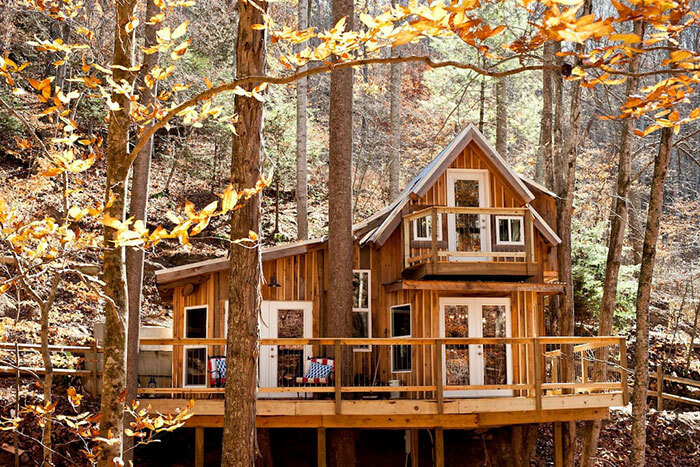 This incredible 600 square feet treehouse sits on 6 acres of wooded mountainside above a mountain stream. Near Mitchell State Park, the Green Mountain treehouse is only 45 minutes from Asheville and is right across the street from North Toe River. It boasts a large wraparound deck and a Romeo and Juliet balcony off the upper lever master bedroom. The shabby chic décor is inviting and the full kitchen is a huge bonus. There is a queen bed in the large master upstairs, and a queen bed and a sofa bed in the common areas. 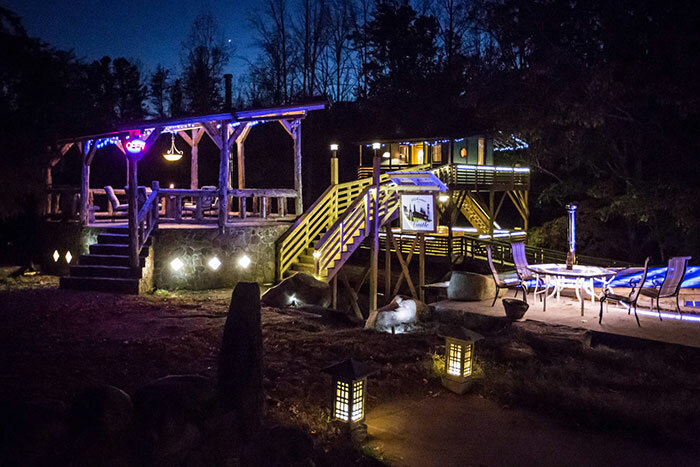 There is a large fire pit, a hot tub, and plenty of waterfalls nearby for your viewing pleasure. 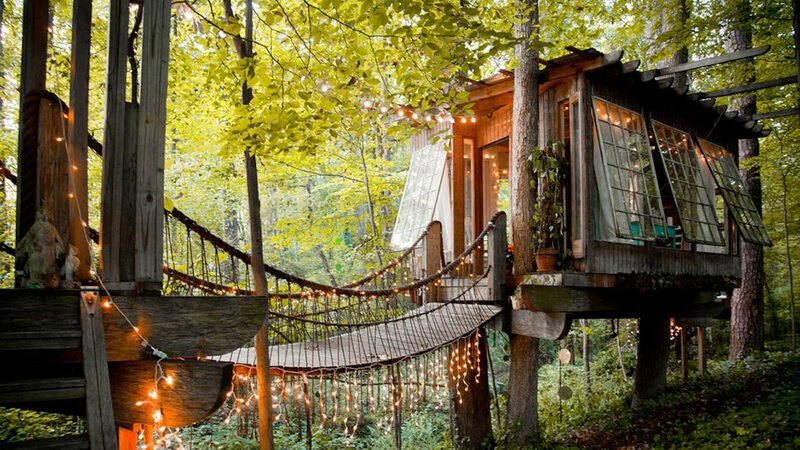 You won’t soon forget your stay in this tucked away treehouse wonderland. 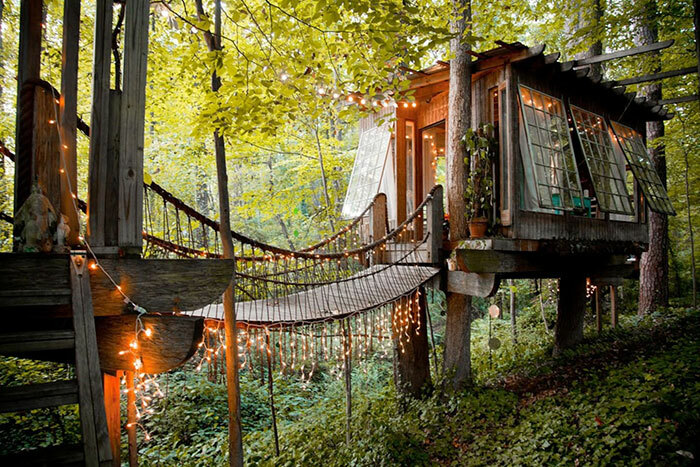 A more picturesque treehouse you’ll never find, this one appears straight out of a fairytale. Sitting on the 60 acre Bolt Farm in South Carolina, this treehouse is dreamy with its vintage décor. The wall of windows and the twinkle lights add to the cozy nature, and the retro board games, record player, and 3-in-1 breakfast maker/coffee pot will stop time as you enjoy your vacation. Savor some afternoon tea as you lounge in the outdoor rope bed and then have a refreshing experience in the outdoor shower. Or maybe you’ll spend the entire time taking pictures of the place for Instagram, because it is seriously enchanting. 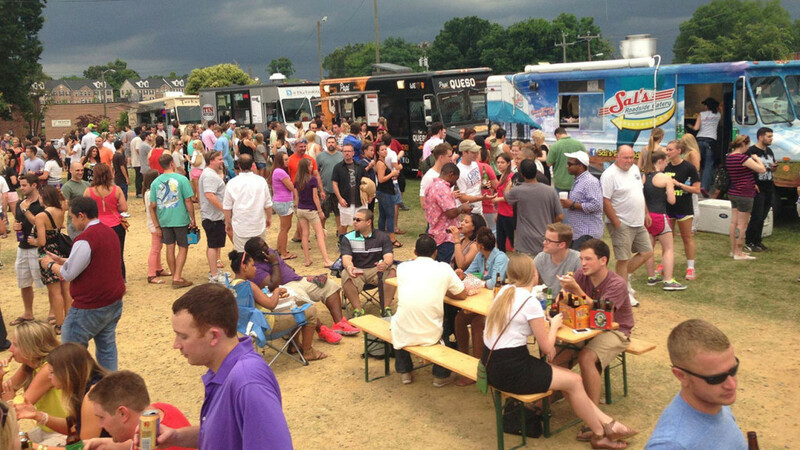 Whatever you decide, you’ll have to plan ahead because this place is booked up months in advance, get your spot while you can. Dates available in March. 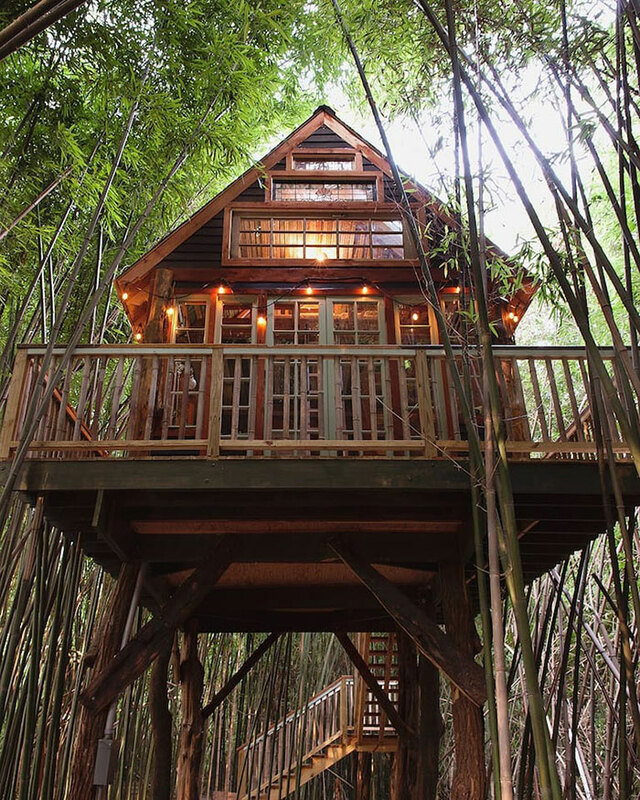 This adorable treehouse made of reclaimed cedar and heart of pine is hidden away in the city, surrounded by a stunning bamboo forest. It has charming gables and stained glass windows that overlook a large wraparound deck. Vintage knickknacks give the place a warm feeling. Oh, and it sits on a working farm that has alpacas—that’s right, steps away from the treehouse are cuddly fluffy alpacas for your petting pleasure! In the bamboo forest you’ll feel secluded but you will be only minutes away from city activities. Dates available in December. 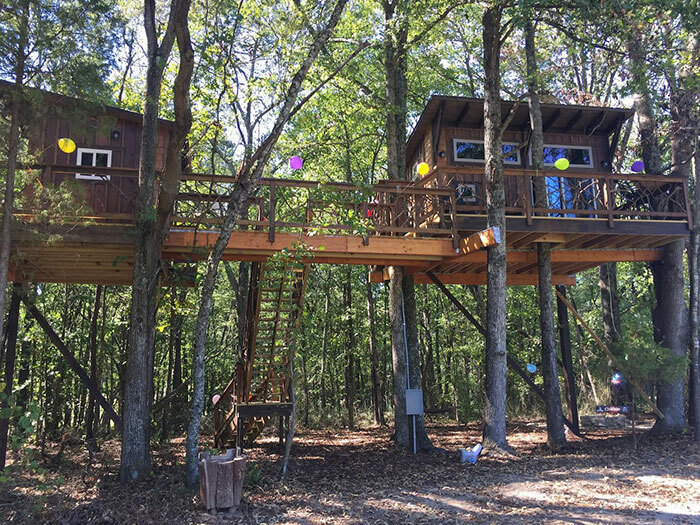 Located on eighty-two acres, this treehouse is located on a secluded part of Wildcat Campground, for privacy. It is made up of three separate rooms connected by walkways. It is ecofriendly with solar panel lighting, and offers a propane powered stove and a k-cup coffee machine. 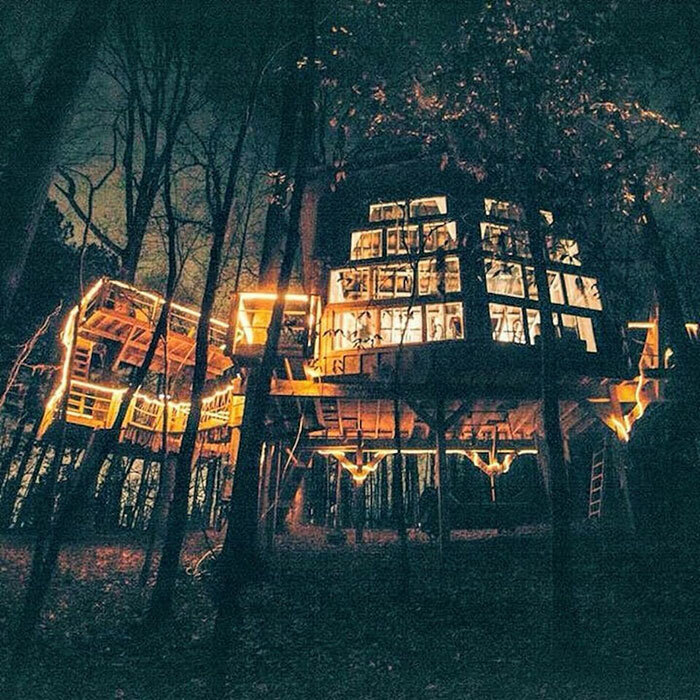 The beautiful treehouse is built from the reclaimed wood of a local saw mill. The best feature—the queen bed can be rolled through sliding double barn doors so you can sleep under the stars. Dates available in December. Recently featured on Treehouse Masters: Ultimate Treehouses, this place is magical, complete with twinkle lights and airy furnishing. The three separate rooms are connected by rope bridges and the large windows are able to be pushed back so that you can sleep outside. Open to the outside, this treehouse is inviting and gives the feeling of being one with nature (it’s not cliché when you’re talking about sleeping in treehouses!) It is located in the city, but tucked away in a patch of woods, above a stream. The bathroom is located in the basement of the host house, which the guests have a private access to. The antique furniture and decorations paired with the warm lighting gives this treehouse an other-worldly feel. Dates available in March. Located on a twenty-one acre compound, this treehouse gives you access to the property’s yoga studio, sauna, dipping pool, zen barn, meditation room, sky lounge, picnic area, golf course, and canoe pond. Relax on a retreat of your own agenda, taking in all of the extra accommodations. The main house on the property called the Castle offers a communal kitchen, library, and sitting porches. The property offers additional suites in their on-site cabins. Dates available in December.